These pseudo transparent parchment bundles are just what I would have loved as a kid. I absolutely adore that you can see the candy through the parchment paper and you know what you're about to devour. 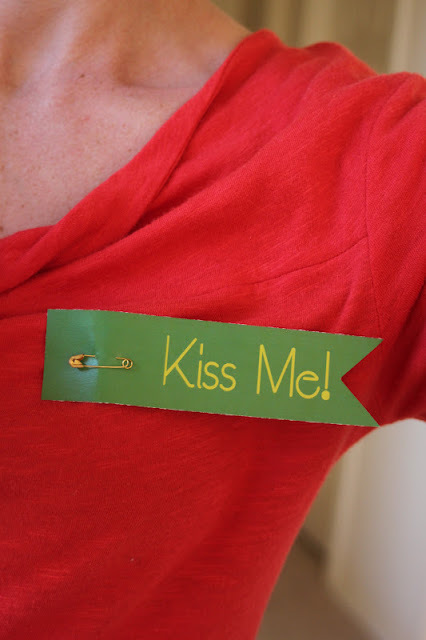 Plus, they were such a cinch to make. First-- download, print, and cut the Easter egg template. (see link to download below). Another fun thing about parchment paper-- you could cut it to printer paper size and print the actual template onto it if you like, but then you won't be able to see through the paper. That would still be super cute, though! I also thought about letting the kidlets color the cut out parchment paper eggs before sewing with crayons or markers, but then I realized it was bedtime and I was out of mommy/kid crafting time. 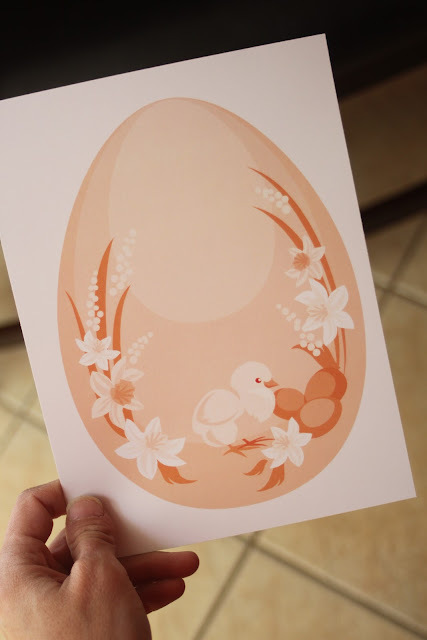 Next, trace the egg template onto the parchment paper and cut the stencils out, making sure to cut out two eggs per candy bundle. 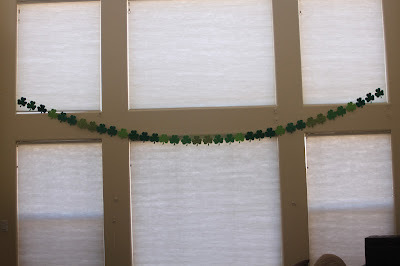 Now, pin the parchment eggs together and sew around the edges, leaving a spot in the top to insert the candy. 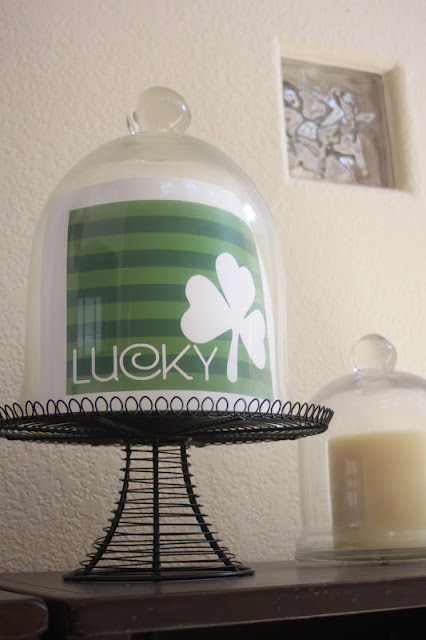 Drop the candy in and sew the egg up. I tried a few different eggs and while the one compartment egg was certainly the easiest I really like the look of separating the candies by sewing in between each layer. Tip-- don't overfill the eggs with candy. Leave a bit of room for the sewing machine foot. If the candy is butted right up to the edge the sewing machine foot ripped my paper because it was too tight of a fit. 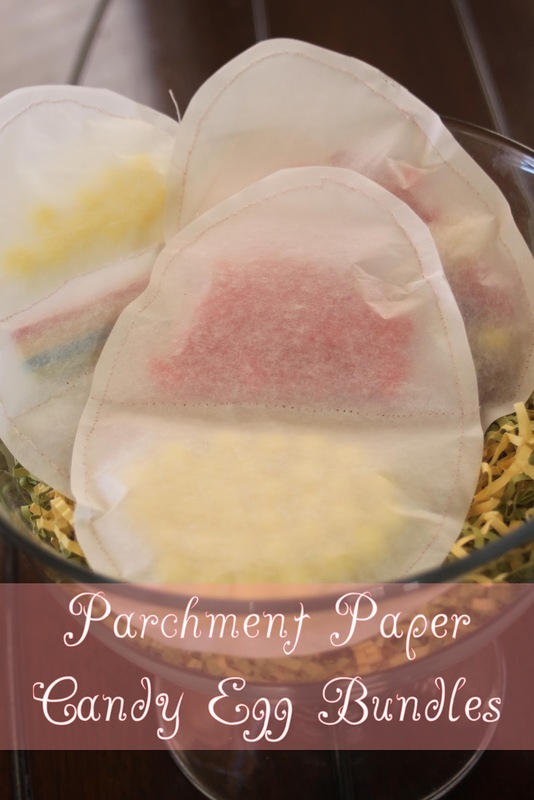 OR lift your sewing machine foot altogether and eliminate it from even touching the parchment paper. Now, all that is needed is to hide these fun candy bundles on Easter morning and watch the kids tear into them with wide eyes to see their yummy surprises. If you want to use the Easter Egg template click the button below to download. With Easter being just around the corner I've created this simplistic brunch printable set. I love the light pale colors and hopefully you'll like them too! 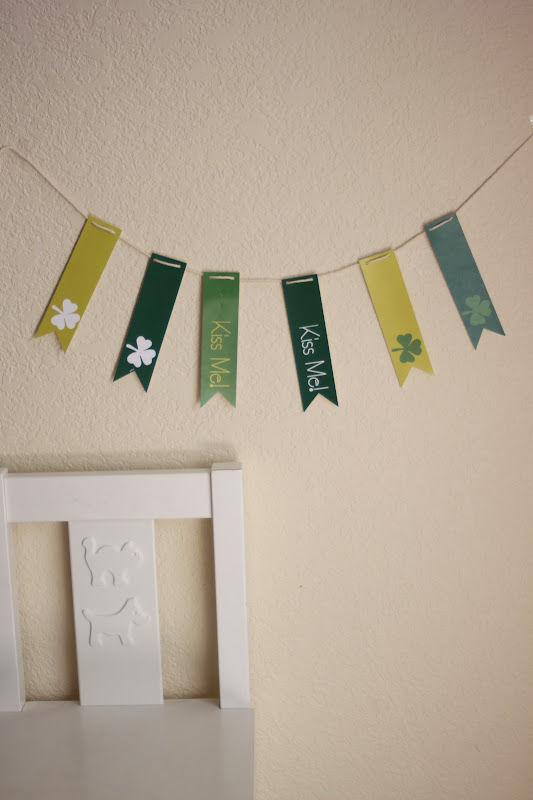 Included in this set: banner (print the banner pages twice or even three times to achieve a longer banner), cupcake toppers/party circles, invitations, and food labels. The food labels are not pictured, but follow the download link to sneak a peak. Also, I found these adorable "carrot candy" cupcakes on pinterest and followed the link to Squidoo. 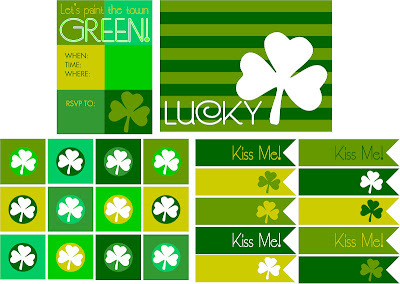 I love the simple design, using orange and green colored candies. The original poster used M&M's, but I decided to use Starburst Jelly Beans-- keeping with the Easter theme a bit more. I just LOVE Easter. Do you have any fun Easter traditions you do with your families? 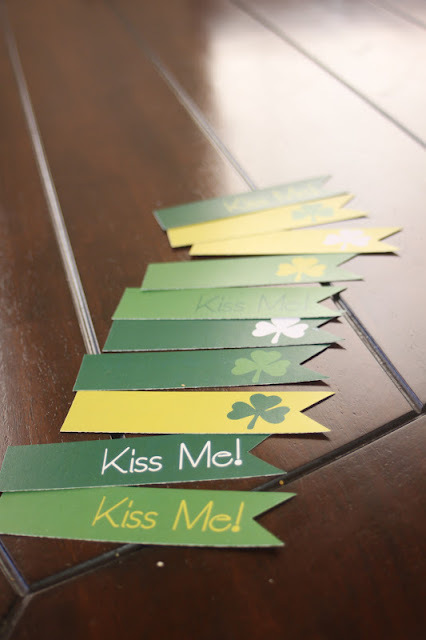 St. Patty's Day Straw Flags Done 3 Ways! Holidays (small or large) get more exciting each year as the kids get older. I'm excited to pull out all of the leprechaun pranks and green foods. 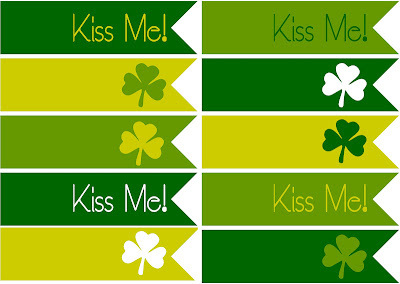 I know I've already shown you these St. Patty's Day printables, but I thought it might be helpful if I show them in use multiple ways. 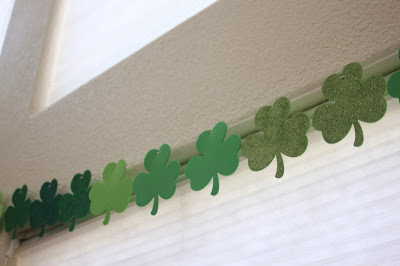 ...or as a little banner hung next to the leprechaun's treats left in the kiddo's shoes. 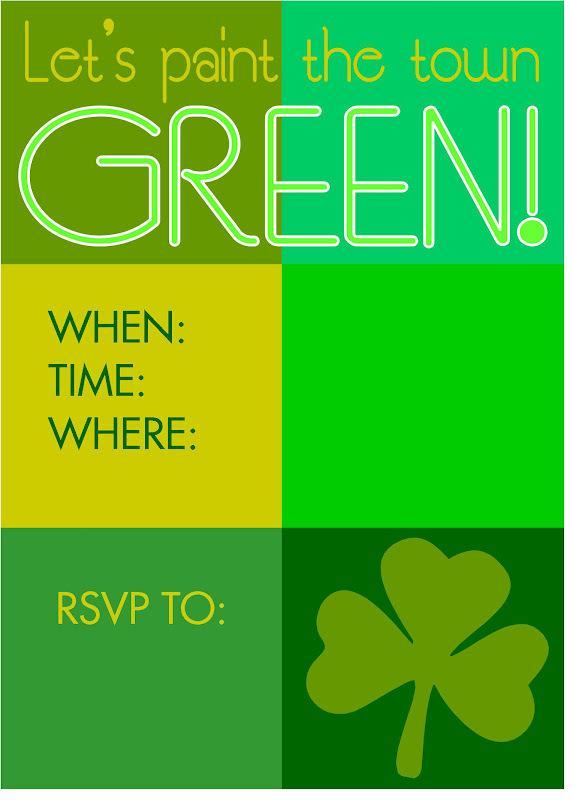 Can't wait to stuff their shoes with fun green treats (ideas-- mike & ikes, sprite, limeade drink, green spearmint gum, green canister of pringles...etc. you get the jist of it). 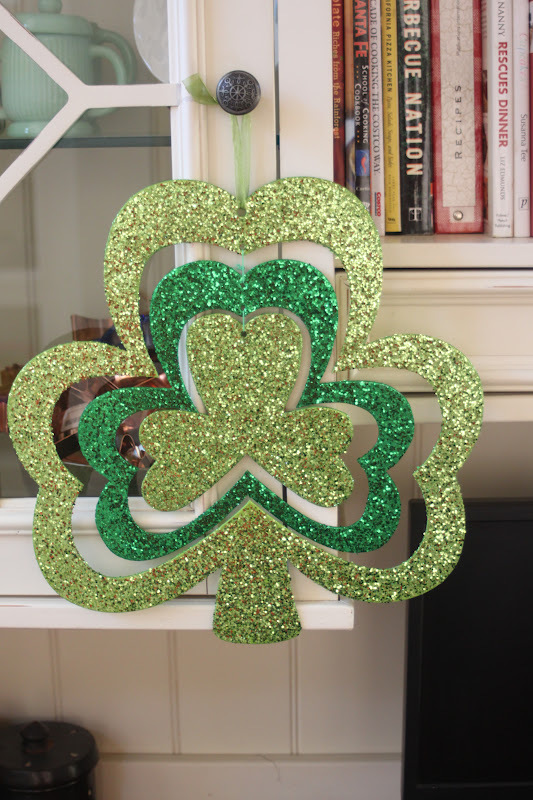 This was a quick shamrock banner made by those sparkly foam cut outs that can be found at any craft store. I got mine at Michaels 50% off and three packages cost me all of $3. Love deals like that! 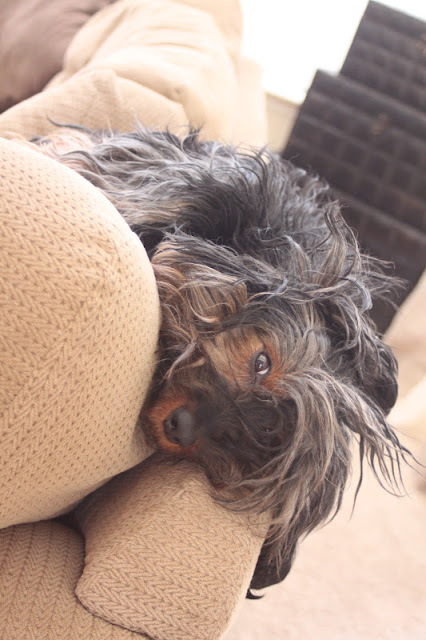 As I was hanging banners and taking pictures, this little fella snuggled in on the couch to watch me. 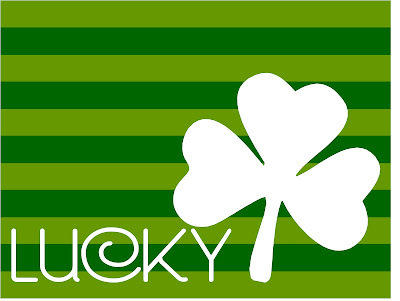 Too bad his name isn't "Lucky", that would be so fitting for this post. 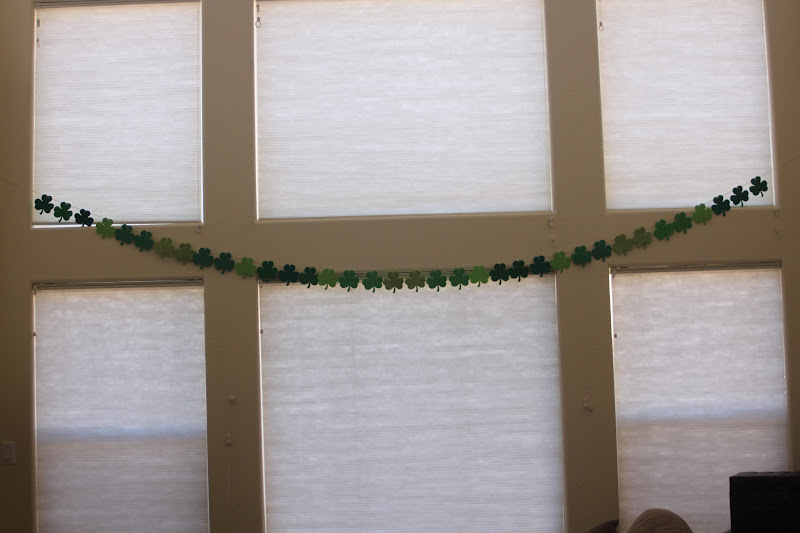 Thus, his name is "Gus" and we love him whether he's an Irish dog or not. I may not be Irish, but it's still fun to celebrate this fun green holiday! So lucky for you...I have some FREE St. Patty's party printables to share. 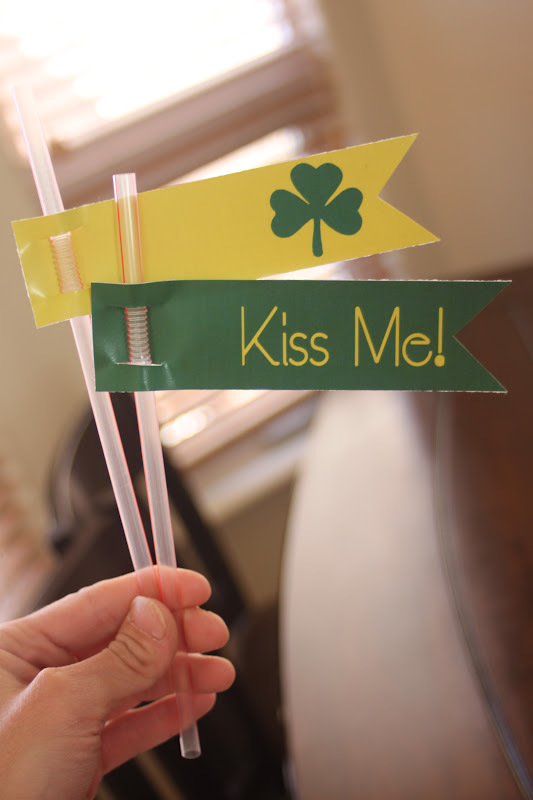 The package includes: "Lucky" framable sign/print, Invitations, Cupcake Toppers, and "Kiss Me" Straw Flags. Hope you haven't put away your Valentines heart cookie cutters yet! These shamrock Rice Krispie treats were a hit at our household and my little ones enjoyed eating all the many scrap leftovers. Rice Krispie treats are some of the easiest things to make, so I feel a little silly posting this, but what the heck. It was a fun make and hopefully you'll find it fun as well. Needed: Rice Krispies Cereal, Butter, Mini Marshmallows, Green Gel Paste Coloring, Heart Cookie Cutter, Wooden Skewers, and Plastic Wrap. Oh, and don't forget some cut green ribbon too! Once the marshmallows have melted add a few drops of the green gel paste and stir until you get the coloring you desire. Then add the cereal and stir stir stir like a crazy woman. Then quickly transfer it to a greased pan before it cools (which happens quickly). Next, spray your cutter with non-stick spray and start cutting your hearts. 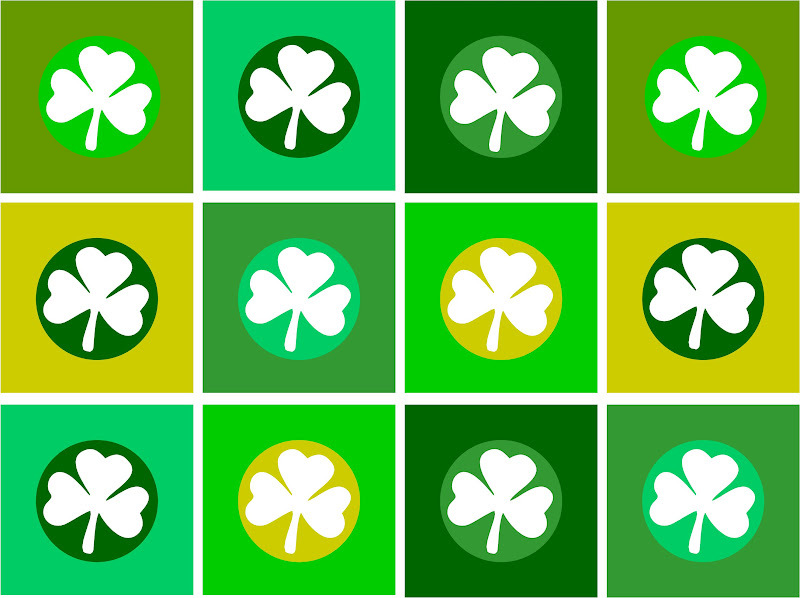 I used three hearts per shamrock, smooshed them together and shoved a skewer in the center to hold them all together. Then, let them cool completely before wrapping. Such a sweet edible bouquet of Krispie treats. Directions: In a fairly large heavy bottom sauce pan melt the butter and marshmallows. Once completely melted add the food coloring until you've receive the coloring you desire. Next, add the Rice Krispie cereal and stir vigorously. Immediately transfer over to a greased pan and cut out shapes before it completely cools. Now, enjoy! My little monsters sure did. The dinosaur hunt hats aren't needed for this activity, obviously, but it sure does make them look cute. I bought these hats and the foam lettering at Hobby Lobby and my littlest one, Graham, loves to wear his all day long. So, how do we play this game? 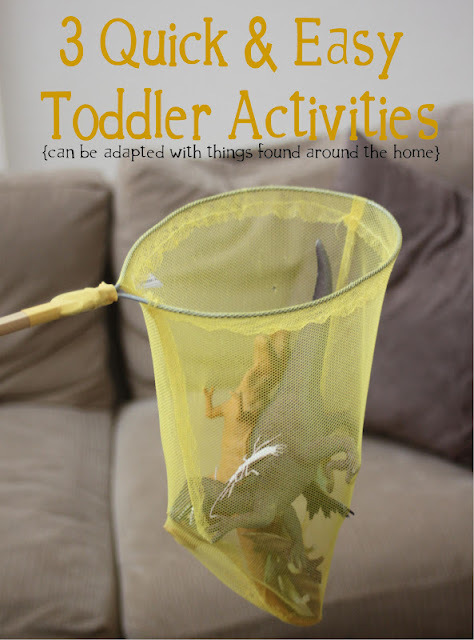 First, I make my kids hide in the corner with their nets and hats while I disperse of all the many dinosaurs (and other plastic animals) around the room. I make some of them difficult to find for my older one, while the majority are just scattered on the floor in plain sight. Then they come running from their corner and collect as many of the animals as they can until their nets are about to burst. Then, we play it again! Fun stuff, I tell ya. So in addition to dinosaurs, my kids adore fruit loops (yep, I'm that mom that allows them to eat sugary cereal). The kids enjoy threading their fruit loops onto their string. I love watching their concentrated faces as they try their hardest to bead their cereal. Then, we tie knots in the end and wear them as necklaces. It's kind of nice, really. They have snacks on the go and I don't have to worry about them spilling all over the ground and getting crunched into the carpet. Plus, stringing the cereal helps their chubby little fingers to develop manual dexterity and hand-eye coordination. Graham thinks it's pretty cool to eat them straight off of the string. Everyone has a blanket laying around, right? In my case, one too many blankets reside in my house. Which reminds me-- I need to make a trip to the Good Will. Anyway, Miles and Graham are mad for blanket rides. Usually toys, balls, and snacks accompany them on these rides. Typically following these rides is the request to be burrito-ized! I swaddle them tightly and they giggle and wiggle their way out and then we do it all over again. I can't imagine how much fun this would be, but then again any time spent with my mom I enjoy so I'm thinking they might just enjoy the attention they're getting from me and making me laugh in the meantime.